To make callos, the main ingredient, honeycomb tripe, was easy to find in Chinatown but I was visiting store to store to find blood sausages. There was no way my version of callos was going to have Vienna sausages from a can. 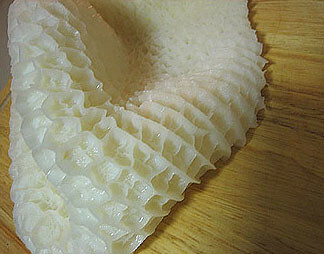 (Honeycomb tripe is the reticulum, the first compartment in the cattle’s stomach.) My trustworthy Spanish deli, DespaÃ±a, was closing for the day when I tried to buy them. The guy at the counter refused to sell them to me because the register closed five minutes before I got there. Talk about customer service. I ended up at Dean & Deluca but the packages on display were all expired. Dean & Deluca not carrying something I needed only meant one thing: I have to go to the Whole Foods at Union Square, the worst place to buy something like blood sausages. But I sucked it up and zigzagged my way through their awfully-designed space, past the beautiful people who don’t appreciate produce as much as they fawn over the buffet and of course, received the expected responses from the clerks behind the counter: what is that?, blood what? and I donâ€™t think we carry those. A stranger overheard me and, bless his heart, tipped me off to a smaller store on Sixth Avenue between 11th and 12th Streets. 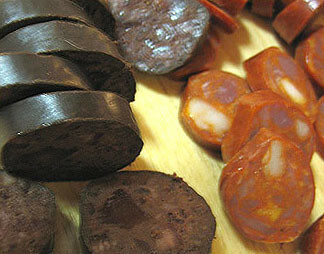 It was called Jefferson Market and I hit the jackpot with their blood sausages and Spanish chorizos. I spent a total of five hours roasting beef bones, simmering them and straining the juice into containers until I had proper beef stock. The next day, I scrubbed the fat off the honeycomb tripe and cleaned off a veal’s foot before I boiled them together. The day after that, I finally got to work. Callos [kahl-yohs], or tripe in Spanish, is a famous dish from Madrid. Like other Spanish dishes, it comes with chorizo and tomatoes. Filipinos adapted the recipe, and after more than 350 years as a Spanish colony, we have made it our own. 1. Cook tripe and veal’s foot in a large pot and cover with water. Add whole garlic and onion, peppercorns and bay leaf. Bring to a boil; remove scum as it rises. 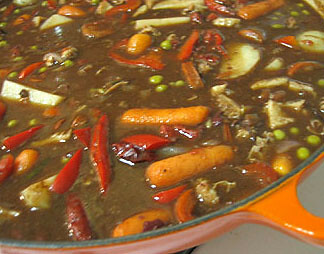 Cover and simmer until tender, about 4 hours. 2. Transfer the cooked tripe to a plate and cool. Strain the stock and reserve 2 cups for later use. Cut the tripe into 1-inch strips. Discard veal’s foot. 3. In a large Dutch oven, heat the olive oil and sautÃ© the garlic, onions, tomatoes and chili peppers until fragrant. Add the chorizo and brown. Increase heat to high and add the tripe. Add the blood sausages and some of the beef broth. Season with salt and pepper. Bring to a boil, cover and simmer for 20 minutes. 4. Uncover the stew and add the potatoes with the rosemary and peppercorns. Add the last of the broth to keep the stew from drying up. Add the rest of the vegetables and cook until tender. Season with salt and pepper. Squeeze some lemon juice before serving. Okay-dokay, no guts no glory! oh wow! this sounds so interesting…something to look forward to! awesome time for this theme — puede nang mag-barbecue. LOL Kai:) thanks for hosting, cia! e yung pinapaitang kambing na me kasamang tae ng kambing. seryoso! haha. this is sound exciting mukhang join ako nito! I can’t wait for the next LP – congratulation for hosting the LP 9! this really is a challenge! since the announcement i still can’t think of anything but i will surely try to come up with something…. I’ve been getting a few emails about this round — there are plenty of recipes out there that uses offal as main ingredient but try to make it into a Filipino dish! We don’t want this to be about French cuisine! I will definitely join LP9. Thanks for hosting! hello there! how can i join lp9? Hey there Cia! It is nice to know you live in the Big Apple. I love New York! I definitely will join LP 9. I have love the LP Concept and support.. so i will try for the LP9 too! “VIVE LE LASANG PINOY” ahaaah!